The “Permanent Internet Tax Freedom Act” was passed today by the US House Of Representatives. The bill would extend a 17 year moratorium on Internet access taxes and forbid states from taxing the internet and companies who have no physical equivalent. This is a real benefit to Internet companies as well as people who access the Internet. 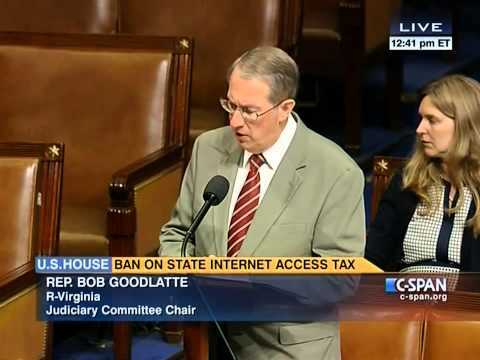 Representative Bob Goodlatte, a Virginia Republican and bill sponsor said that if the tax moratorium is allowed to expire, Internet users would be hit with a “substantial tax burden”. The bill now goes to the Senate to be voted on. There are Senators who resist a permanent tax moratorium. Can you guess who resists it? If new taxes were allowed, Internet users would be hit hard. Especially low income users who enjoy and rely on the Internet for entertainment, news, communication as well as saving money. The past moratorium allowed 10 states that already were taxing access to be “grandfathered in” and keep taxing. Among those states is Tennessee, Texas and Wisconsin. The new law if passed by the Senate and signed into law by the President would end all access taxes and forbid any state from doing so. We do not promote any particular political agenda at tse.net – this bill is about business. This is about being allowed to grow a good business. You should contact your state’s Senators about H.R.235 and let them know your opinion.